The number of web-based graphic creation packages has exploded over the last two to three years and that’s great news for creators of online courses. These web apps offer many, many helpful resources for creating graphics and resources for e-learning and most of them are actually free to start using. They can also help create a more efficient workflow when developing graphical content for your courses. Ben and I have both used Photoshop for years to help us create images for training courses, websites, blog posts, and social media. We also recently started experimenting with an app for Mac called Sketch. However, software packages like these are resource hogs when they’re running and can slow your machine to a crawl if you’re running anything else. Web-based graphic creators allow you to get images created faster by letting their server take care of the heavy lifting. About a year ago, I was introduced to an online graphic creation tool called Canva after reading about it in a roundup article evaluating several of the options in that space. And I have used it almost every day since then for one project or another. See the image above this article? 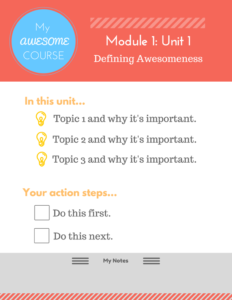 You may already be familiar with Canva, however, today I wanted to share some of the ways you can use the platform to create awesome content for your online courses. Once you land on the Canva homepage, you can set up an account for free. You can even avoid the whole back and forth email confirmation process and sign in with your Facebook or Google account if you choose. You’ll also notice that at the very top of the design manager page, there’s an option to use custom dimensions. This option allows you to set a specific image size and begin with a blank canvas for your project, dropping in various elements such as text, images, shapes, etc. I would recommend starting with a few of the templates first just to get a feel for how the platform works. The templates are also great for a little creative inspiration if you’re stuck. Also, keep in mind that the pre-made templates can all be edited, so you can add/remove elements, change colors, change fonts, and more. *Search: Entering a term in the search field will bring up any images, illustrations, or templates relevant to the search term. Now I mentioned that Canva was free, but they do have a couple of revenue streams. One of those is that they do offer some premium images and illustrations, most of which are $1 to purchase. However, I’ve used Canva for about a year now and haven’t spent a dime. *Layouts: Depending on the project type you selected on the previous screen, the available pre-made templates will be here for you to browse. *Elements: This will be the library to work with when starting from scratch or modifying a template. It includes free photos, grids, frames, shapes, lines, illustrations, icons, and they recently introduced charts. *Text: This is of course where you would add a heading, subheading, or body text to your image. However, I also jump in here all the time for inspiration by looking through the pre-made text elements. *Background: This one’s pretty simple…choose a template background for your project or create your own. *Uploads: Remember when I said I’ve never spent a dime on Canva? This is why. 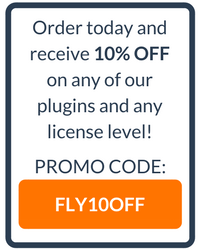 You can upload any of your own images, logos, or illustrations and I already have a subscription with a premium stock image service so I import what I need here if I can’t find it. The project editor itself is actually very simple so we won’t cover that in detail. It has all of the straightforward commands you would expect to see; font, font size, font color, alignment, spacing, copy elements, delete elements, etc. As you’ll also notice, there is a “Download” button at the top of the screen. Once you’ve finished your design, all you have to do is click that and a PNG file will be sent right to your local downloads folder! Let’s Move On to the Fun Stuff! Now that we’ve looked at how to use Canva, let’s get into all of the resources you can create to make your online course more interesting! When Ben and I created our very first online course several years ago, we spent a lot of time creating and editing videos. But we spent almost as much time creating an “Action Guide” in PDF format for our students to download within each course unit. It provided a quick overview of the important topics covered within each video and also included a checklist of the steps we were asking them to take before moving to the next unit. And of course, PDFs can even include hyperlinks, so if you need to you can link out to any additional resources right from the document. Our students told us time and time again that the action guides added an incredible amount of value to the course as they didn’t have to be logged into the course to review what they needed to be doing. It’s becoming very common to see infographics within online courses. Infographics are often very useful in demonstrating certain complex concepts and are one of the best tools available for conveying data and measurements. They’re also helpful for teaching processes, as they are great for visually outlining steps. Add in the fact that they typically distill a topic down to the major key concepts while leaving out the fluff, and they can be a great addition to an online course. 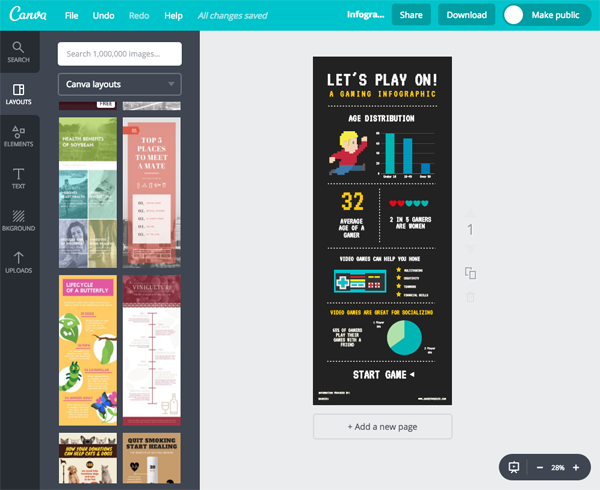 I’ve used a number of the online infographic creators (most notably Piktochart), but Canva has made a big push recently to become one of the major players in this space also and they already have dozens of templates available. Personally, I think that Piktochart has a better library of designs as infographics are their primary focus, but if you’re only creating a few Canva is a great choice. And if you’ve never created one, infographics are seriously one of the most fun types of content to create. Give it a try…surely you have some content in your course which would translate to a great infographic! We’ve since seen dozens of other WP Courseware users implement this navigation strategy and in some very cool ways. 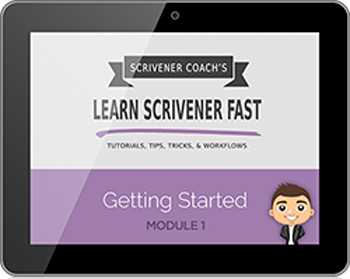 Jospeh Michael’s Learn Scrivener Fast course is one of the best. But Canva is a great tool for creating these as well. Since we launched WP Courseware five years ago, we’ve looked at thousands of online training courses created by our customers. And it’s shocking how few course creators make use of branding within their training. Again, Joseph Michael, who I mentioned above, does a great job with this and he keeps a consistent brand across his website, courses, individual lessons, downloadable resources, etc. When Ben and I created that first course which led to the evolution of WP Courseware, we did the same thing. It was a comprehensive membership site with not only the training, but also forums, ebooks, and many other elements and we always ensured that our brand was present everywhere. 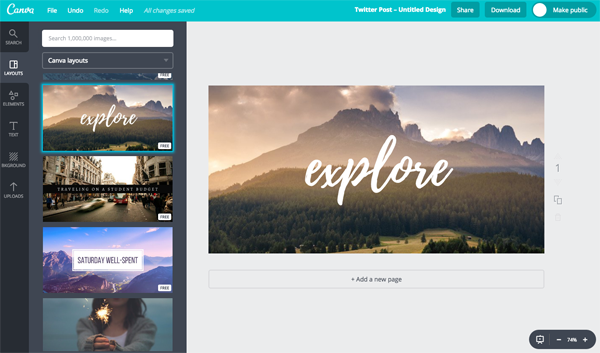 Canva has a lot of tools and template for blogging and social media which can help you easily create branded graphics to place within your course units to keep consistency throughout all of your training material. For example, Joseph’s little cartoon avatar of himself appears everywhere…even dressed as a ninja in the weekly tips he sends out via social media! A recent survey of WP Courseware users let us know that over 90% of them use video as their primary training format. And of those users who deliver video training, over 60% of them use the same recording approach…presentation slide decks with voice overs. Why? It’s simple, inexpensive, effective, and let’s face it, it’s a little intimidating being in front of the camera. 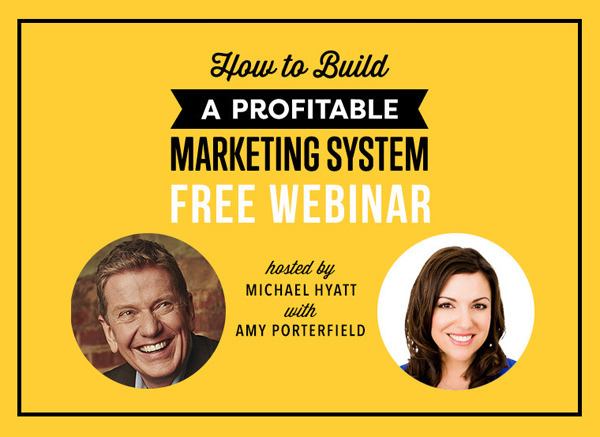 If you’ve ever attended one of Amy Porterfield’s webinars, you’re well aware of what a great job she does with presentation slides. They’re clean, colorful, consistent, and well, just fun to look at! Everyone has seen all of the same old PowerPoint and Keynote templates used over and over. Your presentation slides are another great opportunity to brand your course and Canva is a great tool for that. They even have their own templates for you to start with. 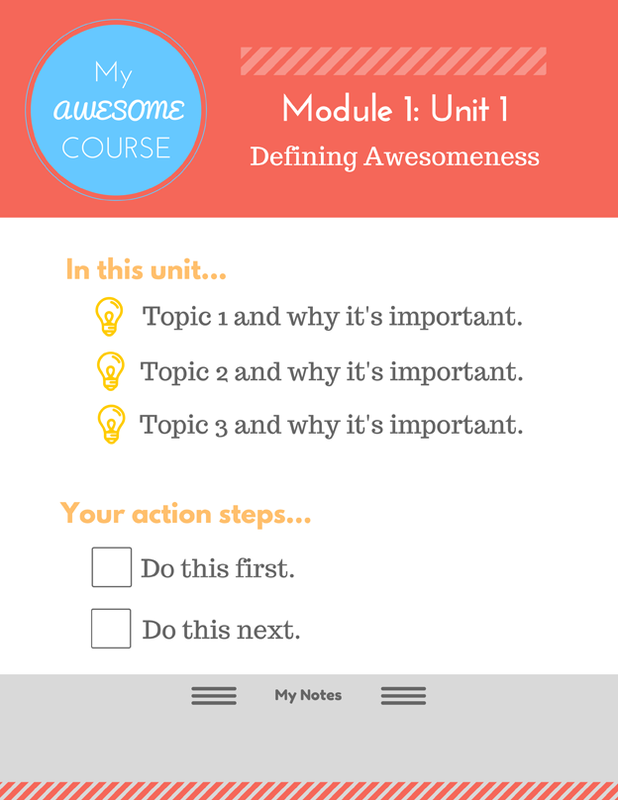 Similar to action guides, any number of other supplemental resources can be created using Canva. We’ve seen WP Courseware users create workbooks for their course, entire ebooks to accompany the course, “cheat sheets” for quick reference, checklists, and I have even seen one productivity coach using WP Courseware who created his own daily planner for his coaching clients to print out and use. The sky is the limit, but Canva has templates for all of these as well and it makes them simple to create. In fact, a lot of the free ebooks I see being offered as lead magnets for list generation are actually a series of presentation slides. So what are you waiting for? Start today by making a list of things you can add to your course to aid in the learning process, extend your brand, offer more information, and stand out among your competitors! Do you have other ideas for using graphics in courses? Feel free to share with us in the comments below!